Updated April 2018. Originally posted Jan 2016. One of my favorite things in the kitchen is using flexible recipes. I favor methods rather than strict recipes most of the time. (You may have gathered that given the number of suggestions for ways to change things up in pretty much every recipe!) I guess that the thing I want people to know about cooking (especially healthy cooking) is that it doesn’t have to be hard or boring. I absolutely love taking a lazy weekend afternoon to roast a whole chicken or make something more time-intensive or fancy. But I think that the most consistent success in making healthy eating and healthy cooking part of your regular routine comes from making it easy and accessible. And, for most of us, there are more busy days and evenings in a week than there are days for long or laborious cooking. I’ll never give up a great fancy-pants recipe for good (some things are just worth the extra effort! ), but I love something quick and easy for weeknights. 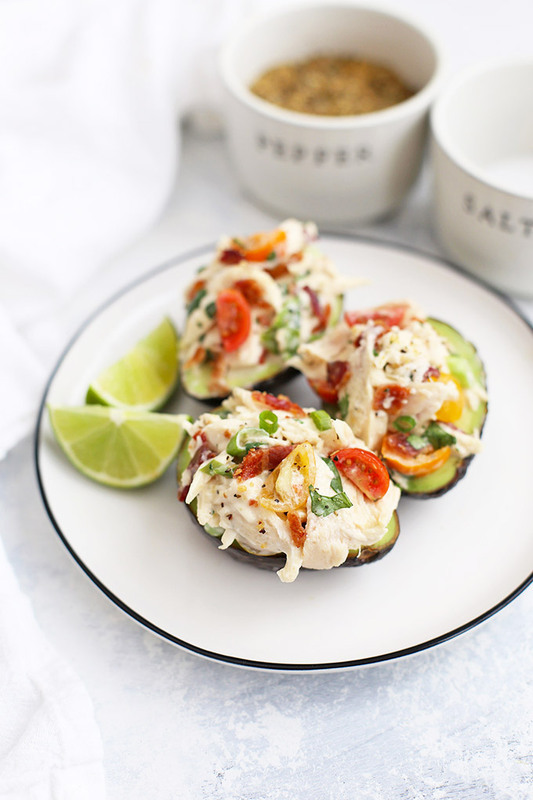 These BLT Chicken Salad Avocado Cups are a fresh and fabulous example. Use up cooked chicken (or pick up a rotisserie chicken! ), and mix it together with a few simple ingredients. Scoop the whole thing into half of an avocado and pair with some fresh fruit and veggies or a side salad for a delicious dinner. The beauty of this idea is, like any sort of sandwich, you can change it up any way you like. Feel free to stir in a bit of diced celery or some chopped bell peppers if you like, or swap ranch dressing for the mayo. Maybe the BLT Chicken Salad vibe isn’t your jam. In that case, I have FIVE other versions to try in this Ultimate Guide to Chicken Salad. All of them are awesome in an avocado. Bake Your Bacon! I swear by baking my bacon. I’ve found that it cooks much more evenly, and it’s less work and mess for me! Just line a baking sheet with foil, then bake it at 375 degrees for about 20-25 minutes. I love that I don’t have to stand over a splattering pan at the stovetop–I can just pop it in the oven while I do other things, and get it out when I’m done. Plus, I often cook an extra batch to store in the freezer. That way I get twice the prep done and my house only has that “after-bacon” smell once. 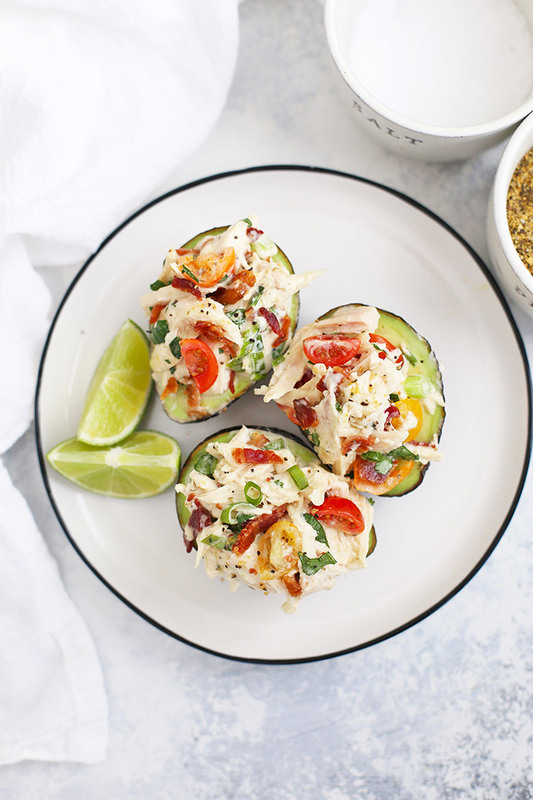 I can pull out a few pieces for a salad (or these avocado cups) or pull out the whole batch later for a different recipe. Try it and you’ll forever be a convert! Packing for lunch. This also makes an awesome lunch. 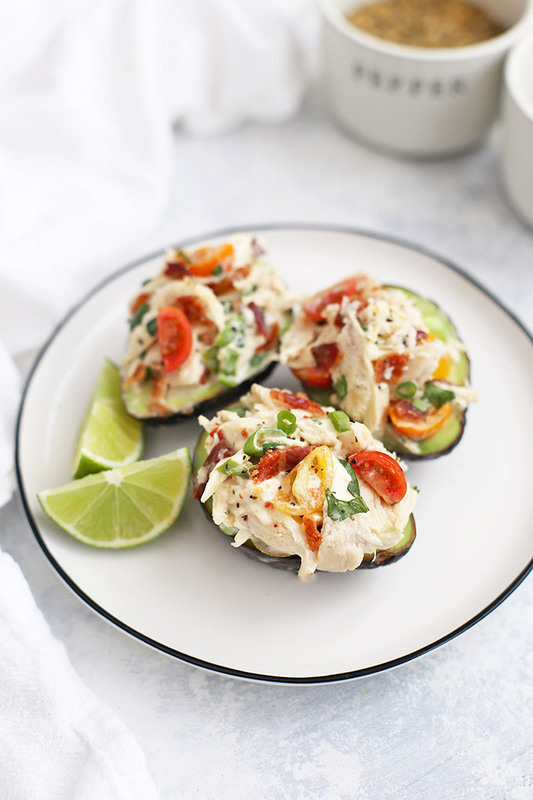 To pack, squeeze a little fresh lime juice over your halved avocado in the morning when you pack it, and then scoop the chicken salad on top right before eating. Bingo! Change it up. 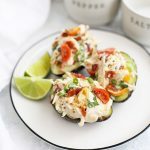 Instead of serving it in avocado cups, you can dice up the avocado, stir it right into the chicken salad and eat it with crackers, lettuce leaves, or wrap it up in a tortilla or gluten free wrap. 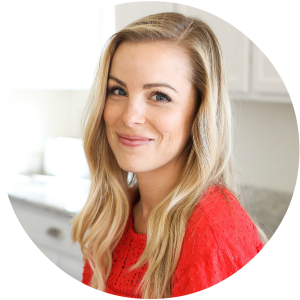 Whole30 Notes – This is easily Whole30 approved. You’ll just need to use approved bacon and mayo. I like avocado oil mayo for a paleo option (or this homemade version). In a medium bowl, mix together chicken, tomatoes, bacon, green onion, herbs, mayonnaise, lime juice, salt and pepper. Taste and add additional lime juice, salt or pepper as desired. Bake Your Bacon! I swear by baking my bacon. I’ve found that it cooks much more evenly, and it’s less work and mess for me! Just line a baking sheet with foil, then bake it at 375 degrees for about 20-25 minutes. Plus, I often cook an extra batch to store in the freezer. 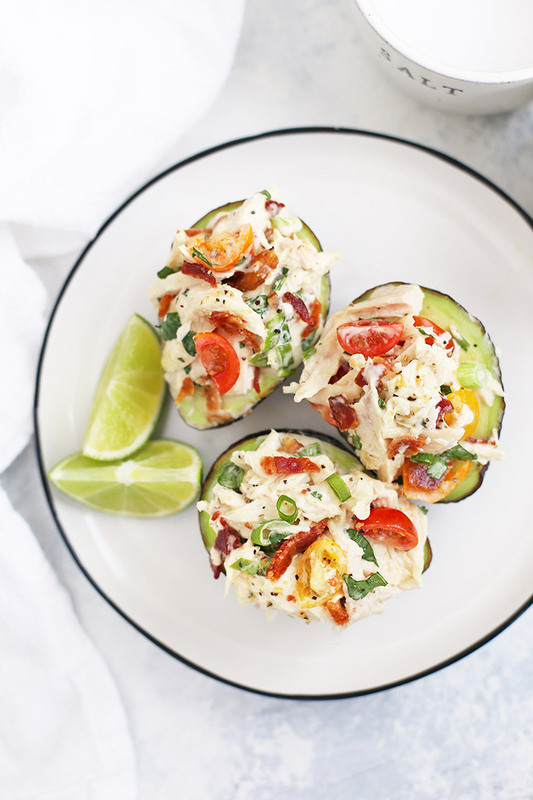 I can pull out a few pieces for a salad (or these avocado cups) or pull out the whole batch later for a different recipe. Try it and you’ll forever be a convert! These chicken salads look amazing! I need to try this asap! This was SOOO good! I had never used avocado oil mayo before, and now I’m a fan! Thanks for the delicious recipe once again! whats the serving size for the nutritional facts? Jordan – It’s 1/4 of the recipe, so 1/2 an avocado + 1/4 of the chicken mixture. I hope that helps!